What a delightful visit with the Rotary Club of Brisbane to start the week! 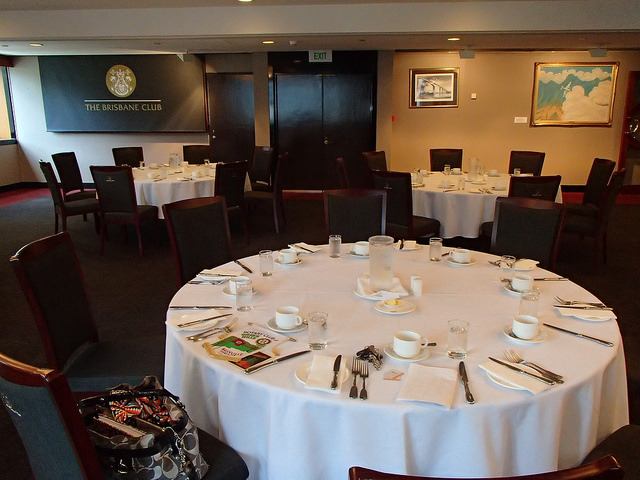 They meet every Monday in the Edinburgh Room at the Brisbane Club for a lunch meeting. Bas Veal was acting President today and greeted me warmly (and with a glass of wine). Every time I visit a new club, I enjoy finding out their history and traditions. The Rotary Club of Brisbane was founded on May 29, 1923 with 16 members. 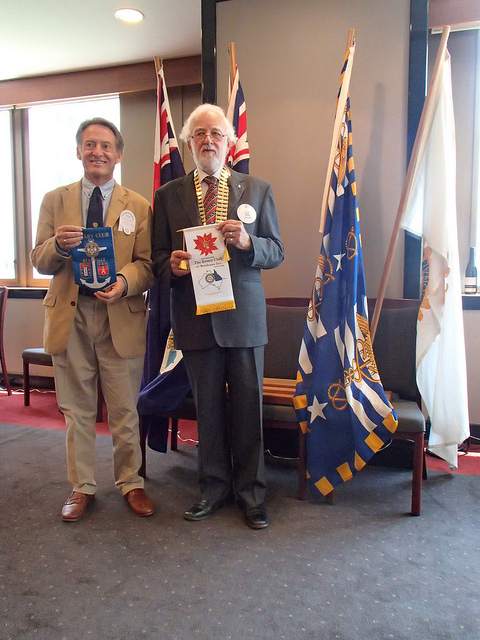 The club was not sponsored by another club but formed under the old system of a Rotary Commissioner, Henry Braddon from the Rotary Club of Sydney in Brisbane’s case, traveling to a town and gathering community leaders. 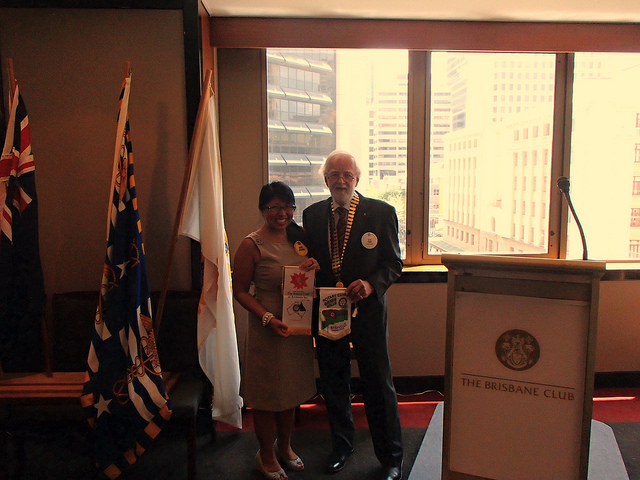 The Rotary Club of Brisbane has since sponsored twelve clubs including Fortitude Valley and Brisbane Mid-City! The meeting protocol is more formal than other meetings that I have attended. Every member is dressed up in a suit and several guests including Rotarian Klau Reitzen from Germany, Rotarian Peter Jackson from France, and Rotarian Malcolm Campbell from Holland were in attendance for this week’s meeting. They must have heard I was speaking! If a Rotarian is traveling, he is welcome to attend any other Rotary club’s meeting as a make-up. Some members even brought banners to swap which is another aspect of Rotary that I really like. I had the opportunity to swap my Rotary Club of Green Hills banner as well! While giving the financial report of the club, they shared how they donated $10,000 AUD to the Philippines disaster in the form of shelter boxes! Each box supplies a family with a tent and essential equipment needed while they are displaced or homeless. To learn more about the shelter boxes, click here! 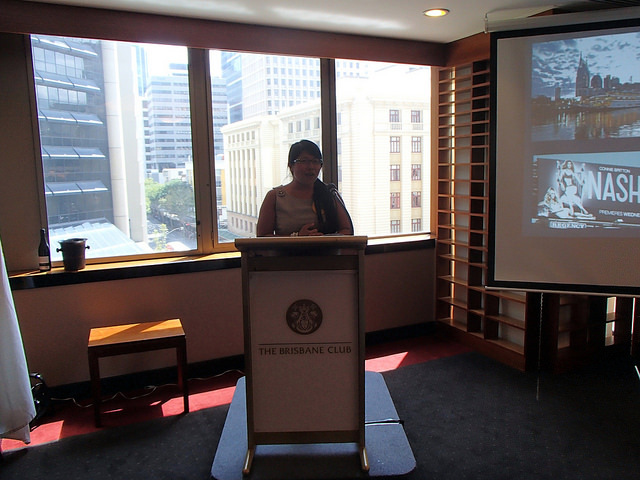 After all the reports were given and lunch, I was asked to speak about being a Rotary Ambassadorial Scholar. Everyone was so attentive and I really appreciate all the questions they ask at the end of my presentation. Many are curious about the similarities and differences I have found between both cultures. Australian rhyming slangs are probably one of the aspects of language I have enjoyed learning about such as “Let’s hit the frog and toad (hit the road).” They asked me to come back and visit their club and I plan to do so before I head home! They are a great club and I am so appreciate to have spoken to them and they were so gracious to include me in their bulletin which you can find here!